Hilary Baker shares with us this obituary she wrote for her father, the violinist Israel Baker, who died on Christmas day. Israel Baker, the esteemed violinist considered by many to have been the preeminent soloist in Los Angeles in the 1960's, died peacefully at home on Christmas day. Mr. Baker was born in Chicago on February 11th, 1919, the youngest of four children to Russian immigrant parents. His musical talent was discovered when, while still in his crib, he called out to his sister that she had played the wrong note on their piano. After debuting on national radio at the age of six, he went on to play with numerous national orchestras including the Dayton Philharmonic, and the Illinois and Indianapolis Symphonies. At the age of 22, Leopold Stokowski selected Mr. Baker as concert-master for his All-American Youth Orchestra. Still later, he joined the NBC Symphony Orchestra under Arturo Toscanini. Mr. Baker quipped that during WWII he "fought the Battle of the Boardwalk" in Atlantic City where he played his violin in hospital wards for wounded servicemen. He met his future wife, Caroline Lotterman, in Central Park where she was raising funds for Russian war relief. Mr. Baker was chosen by Jascha Heifetz to perform and record the legendary Heifetz/Piatigorsky concerts at Carnegie Hall and the Pilgrimage Theater in Los Angeles. In an interview in The Hollywood Reporter he said, "Heifetz once gave me a new piece of music and said, 'Play this.' I didn't make a mistake in two pages," he recalled. "He was surprised, but I'd learned from Franz Waxman that good, trained musicians can sight read. You look through it once and play." Other highlights of his career include his recordings of Stravinsky's l'Histoire du Soldat with Stravinsky conducting, Schoenberg's Phantasy for Violin and Piano with Glenn Gould and Rimsky-Korsakov's Scheherazade (Erich Leinsdorf conducting). His rogue's gallery includes such varied musical luminaries as Yehudi Menuhin, Eric Zeisl, Bruno Walter and Isaac Stern. Mr. Baker was concertmaster for Paramount Pictures, the Columbia Symphony Orchestra and Capitol records and spent decades working with composers including Bernard Herrmann, John Williams, John Barry, Franz Waxman, Andre Previn, and Lalo Schifrin. His daughter Hilary recalls accompanying her father to Jack Benny's house and watching Mr. Benny receive violin lessons. Mr. Baker's musical journey crossed many borders. His discography, a who's-who of jazz, pop and classical, is a reflection of his friendship and collaboration with artists of all genres, including jazz great Benny Carter, Frank Sinatra, Mel Torme', Sarah Vaughn, Nancy Wilson, Barbra Streisand and the Rolling Stones. Mr. Baker always gave credit to his beloved teacher, Adolph Pick. He is survived by his wife Imelda Baker, and daughters Hilary Baker, Merrill Baker, Abby Dart and five grandchildren. A private memorial is planned. Here is Israel Baker, playing the Mendelssohn Octet with Heifetz, etc. Hi Laurie, I'm copy-pasting this comment of mine from a different thread, but Israel Baker was a legend for me (and many others) and I feel I may be excused if I do so. Thanks for letting us know about the passing of Israel Baker, the great violinist very active in the Hollywood studios. While studying the violin I lived near Los Angeles, and it was common knowledge that a contract at the studios was akin to the Holy Grail. I was fortunate to often have Israel Baker as a guest at our home, and his appearances were always memorable. He would often announce his arrival via the telephone installed in his Oldsmobile (an unheard-of novelty in the late seventies) and one evening he played for us Paganini Caprices ...on a viola. Iz famously claimed that he never practised, because his studio work kept him so busy, but it should be noted that he also played "serious" music as well, as his recordings with Jascha Heifetz will testify. His nonchalance on stage was legendary. 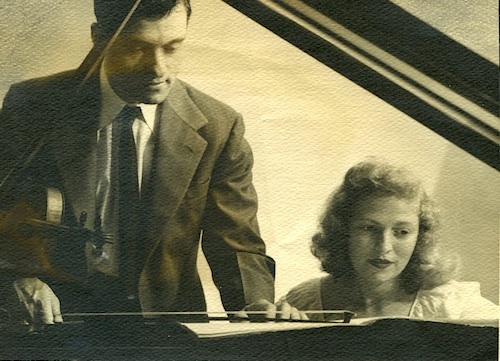 My father, concert pianist Julien Musafia, who performed with him on many occasions, recalls one time when during a cello solo in the Beethoven Triple Concerto he supplied my father with hot stock market tips. In addition to the Jules Garcin Stradivari, he also played a Gand & Bernardel.